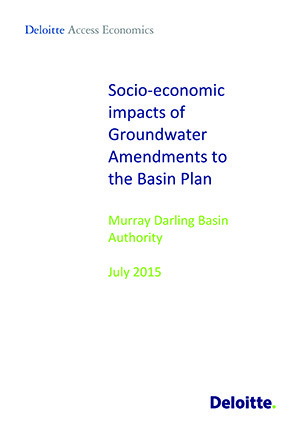 The Murray-Darling Basin Authority (MDBA) proposes several changes to how groundwater is managed under the Basin Plan. A socio-economic analysis was undertaken to assess any potential socio-economic impacts from the proposed changes to groundwater SDLs for the four Water Resource Plan (WRP) areas, and a change to the methodology for ensuring compliance at the state level for groundwater extraction. This analysis has drawn upon the Review Panel reports, Technical Synthesis reports , State Water Registers and local resource and management plans to understand how proposed changes to SDLs might affect water use in regions and across the Basin and therefore result in socio-economic costs or benefits.